In this work a hierarchical approach is presented to efficiently estimate 3D pose from single images. To achieve this the body is represented as a graphical model and optimized stochastically. The use of a graphical representation allows message passing to ensure individual parts are not optimized using only local image information, but from information gathered across the entire model. 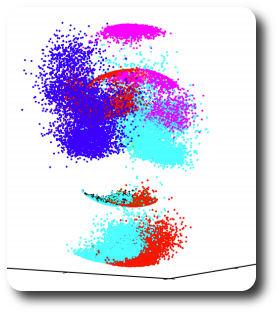 In contrast to existing methods the poste- rior distribution is represented parametrically. A different model is used to approximate the conditional distribution between each connected part. This permits measurements of the Entropy, which allows an adaptive sampling scheme to be employed that ensures that parts with the largest uncertainty are allocated a greater proportion of the available resources. At each iteration the estimated pose is updated dependent on the Kullback Leibler (KL) divergence measured between the posterior and the set of samples used to approximate it. This is shown to improve performance and prevent over fitting when small numbers of particles are being used. A quantitative comparison is made using the HumanEva dataset that demonstrates the efficacy of the presented method. B. Daubney and X. Xie, Entropy Driven Hierarchical Search for 3D Human Pose Estimation, In Proceedings of the 22nd British Machine Vision Conference, September 2011. The video of oral presentation (acceptance rate 8%). can be found from here. This entry was posted in Publication and tagged Computer Vision on September 10, 2011 by Xianghua Xie.